While the Nobel Prizes enthrall us all year after year, decade after decade, most of us never get a chance to grasp the exciting advances of these prestigious prizes. 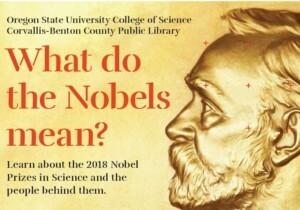 Join us for an evening of inspiration featuring the 2018 Nobel Prizes in physics, chemistry and physiology/medicine with three Oregon State University science professors. Come learn about these extraordinary discoveries and the vital role they play in improving the human condition.